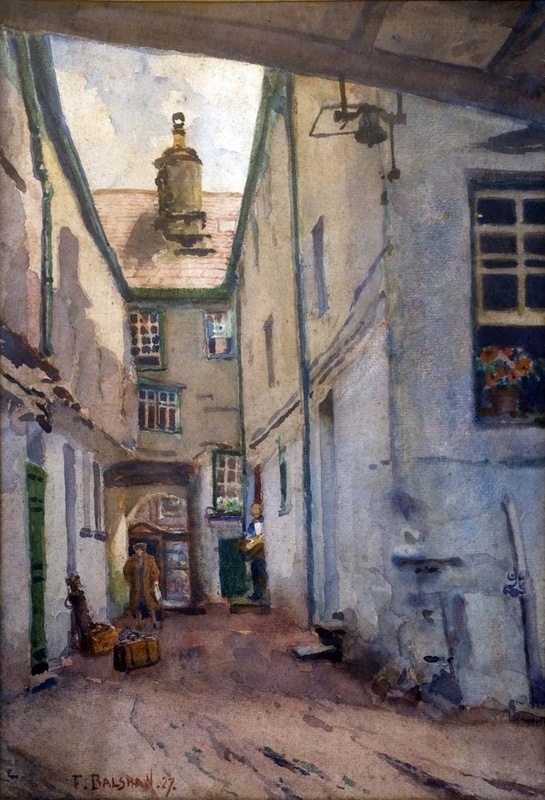 daughter, Freda Francks Balshaw, born in 1894, who was the donor of Courtyard Scene, Kings Arms, Kendal. Freda married Charles Sheffield Doeg in 1917 at the Methodist Church in Rawcliffe Street, South Shore, Blackpool. Charles was born in 1892 in Scotby, near Carlisle, and was educated at Carlisle Grammar School. In the 1911 census he was described as a clerk. He served in the Royal Army Medical Corps during the First World War and received the Silver War Badge, which honoured those who were discharged because of wounds or illness. Their son, Charles, was born in the Fylde in 1918. The family lived for a time at 6 Seventh Avenue, South Shore, Blackpool, certainly from 1924 to 1934.